WOLFSBURG, Germany – December 19, 2008: We’ve seen a lot together and we’ve great plans for the future. This is Volkswagen’s claim for a double jubilee next year: the 60th anniversary of the Federal Republic of Germany and the handing over of the Volkswagen factory by the British Military Government. “The Beetle, Bulli or the new Golf – Volkswagen stands for the democratization of mobility. No other brand has set its stamp on the history of the country in this way,” Jochen Sengpiehl, Head of Marketing at Volkswagen, commented. The brand campaign in Germany gets underway on December 20 with TV spots, followed a little later by print ads which will function as an umbrella for product and brand themes throughout 2009. An emotional look back links key national events such as the Wirtschaftswunder or German reunification with highlights from Volkswagen’s product history. The spotlight not only shines on Volkswagen’s classic models, but also on present and future models such as the “New Small Family”, because Volkswagen also symbolizes the future capability of Germany as an industrial location. “We are setting the standard in the development of affordable, environmentally friendly vehicles and technologies. Our young model range gives our customers the right choice of models at the right time. The success of our company is based on a strong brand and the Volkswagen values which also symbolize Germany’s strengths: valuable, innovative, responsible,” Sengpiehl added. One special feature of the campaign is that all customers and fans are being asked to tell their own personal Volkswagen story. This story can take the form of texts, photos or video clips sent to www.volkswagen-60-jahre.de, a website specially set up for the campaign. Volkswagen is also contacting its brand friends through Internet communities such as “YouTube” or “MySpace”, thus breaking new and innovative ground in online marketing. “We want to contact people via an online community platform and to thank the brand’s customers and fans for making “60 years of value” possible” Ralf Maltzen, Head CRM and Internet Marketing at Volkswagen, explained. The communication agency DDB Berlin is responsible for the creative side of the campaign, cooperating with Tribal DDB Hamburg for online activities. With several modifications on the exterior, a 1973 Volkswagen Beetle that was seized from a recent incident of driving under the influence (DUI) became part of the police fleet of the Blount Country Sheriff in Maryville, Tennessee. 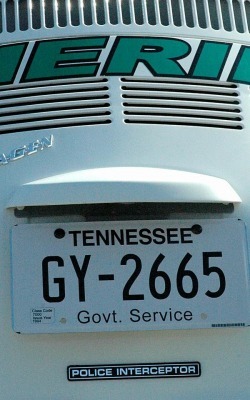 Archie Garner, who is the assistant chief deputy of Blount County, is the man behind the reinvented vintage Volkswagen Bug. Originally clad in red body paint, the DUI-confiscated Beetle was immediately sent to the Maryville county’s beautification group for a revamp to become a Lady Bug. The initial plan for the VW Beetle, however, did not push through and was returned right away to the Blount County Sheriff Office. From there, Garner took over and shelled out his own money to modify the car. A total of $2,000 was spent for the changes done on the Beetle that was christened as the county’s “Bug-erceptor”. It now dons white body paint with accurate police cruiser decals and auto parts like barred rear side windows, siren, radio, and spotlight. To keep the vintage feel of the Beetle, a 1960s police car staple red bubble-shaped light, which Garner bought online, was mounted on the roof. Moreover, the car also has the police cruiser requirements like the fire extinguisher, blanket, measuring device, and traffic cones. The cones used, however, are only four-inched tall to fit inside the vehicle. Although the “Bug-erceptor” is equipped with all the necessities, it is not fit enough for any high-speed chase as its ceiling speed is only around 70 miles per hour. With the comical features of the VW Beetle, it is unlikely to have the authority factor of the regular police cruisers. For that, the bug-like car is planned to be used mostly for public relations activities of the Bounty County Sheriff Office. 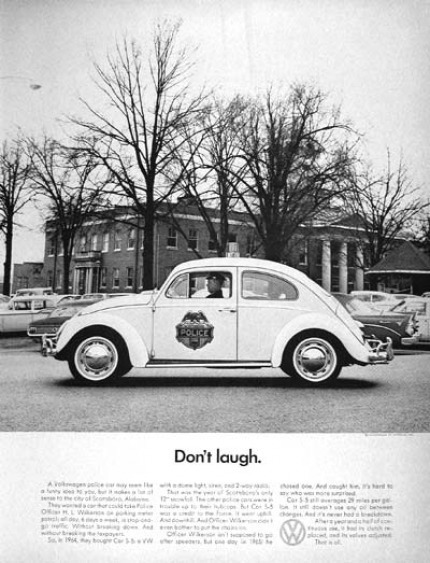 1966 Volkswagen Beetle Police Car original vintage advertisement. Photographed in black & white. Purchased by the town of Scottsboro, Alabama for Officer H.L. Willkerson to run parking meter patrol. Rare VW ad!